Many rare newspaper collectors focus on the more memorable eras of history such as the Revolutionary War, the Civil War, or World War II. Brief date periods –as war events tend to be—can allow for a more concise collection without becoming unduly large if one concentrates on just the major events. Consequently, less notable eras often get over-looked without realizing there is a treasure trove of events which are both fascinating and historically significant found in period newspapers, and well within the range of the average collector. One such era would be the 1800-1860 period which we designate on our website as the “Pre-Civil War Era”. This was a transitional time in American history as the events of the Revolutionary War and the struggles with creating the federal government gave way to a more secure nation and a more independent America as the nation grew in both size and complexity. This sixty year era offers a great wealth of events which were formative for the American landscape. The century began with continual coverage of the funeral of George Washington who died less than 3 weeks before the new century began. Thomas Jefferson was the first President to be elected in the 19th century and he did not escape the headaches of war, as the “Barbary Wars” fell within his tenure. He also lead the charge for the Louisiana Purchase which more than doubled the size of the nation and would be home, in full or in part, for 15 new states that would eventually join the Union. Newspaper reports on the Lewis & Clark Expedition were few and far between, but finding even brief mentions in a period newspaper can be quite a thrill. As the country grew a wealth of notable events transpired & were noted in newspapers of the day. Presidential elections and inauguration are always popular, and there were many in this era: Jefferson, Madison, Monroe, John Quincy Adams, Jackson, Van Buren, William Henry Harrison, Tyler, Polk, Taylor, Fillmore, Pierce, Buchanan, and of course Lincoln, who was elected in this era, but would be inaugurated in the “Civil War Era”, a fascinating chapter of American history onto itself. For those who like to have :complete” collections, finding every election and inauguration is a doable quest. The War of 1812 falls within this era and provides an opportunity for a sizable and notable collection on its own, from the declaration of War to the many naval battles, the attacks on Baltimore & Washington, the significant battle of New Orleans, and the treaty which ended the war. Collectors like that war events typically allow for collection “bookends” (war declaration and treaty of peace), between which they can become as focused as their budget will allow in collecting the major events. 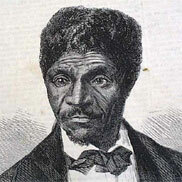 The slavery issue would remain a stain on the American fabric during this era, with events such as the Denmark Vesey and Nat Turner insurrections, and the more notable John Brown raid at Harper’s Ferry, as lead-ins to the Civil War. Abolitionist newspapers would be created, including the Liberator & the Emancipator among others, and names such as Frederick Douglass, Dred Scot, and William Lloyd Garrison would make their marks in American history forever. And it was very much a political issue as well with the Missouri Compromise being just one of several federal decisions which had slavery as a basis. Relations with the Native Americans were troubling also, with the Seminole War, the “Trail of Tears”, and the many broken treaties commonly reported in newspapers of the day. The Texas Revolution of 1835-1836 has a spice of historical romance similar to the events of the Old West, as both were dramatized in movies. The memorable Battle of the Alamo (starring John Wayne on the big screen) and its fiercely heroic soldiers & citizens, who knowingly faced death to establish the independence of Texas, remains a proud moment in not just Texas but American history. The battles which lead up to that event, and those which followed can be found in newspapers of the day, and mention names we remember from history books including Sam Houston and Davy Crockett. The Mexican War was another event which resulted in the expansion of the nation with all the major battles reported in newspapers of 1846 to 1848. Just a few years latter attention focused once more on the West with the California Gold Rush and all the romance of a nation heading west to find their fortune. The newspapers reported those thrills, but also reported the struggles & hardships which would befall the many on the trek to the West. Newspapers of the day were more frank than were history books 100 years later. 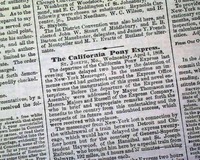 Westward expansion wasn’t limited to the battle fronts or the quest for gold, as the Missouri River Expedition, The Yellowstone Expedition, the Rocky Mountain exploration, and reports on the Santa Fe Trail were all reported as the adventurous were discovering and creating history—and reported first in newspapers of the day. Such expansion was responsible for states to be created, and reports of statehood for Alabama, Indiana, Michigan, and Illinois among others were detailed in newspapers, as were reports of changes needed in the United States flag to honor such additions. The Erie Canal, creation of the cotton gin and the Pony Express were notable events during this period. Famous names were commonly found as their reports were making history & reported in newspapers as such, including the likes of Daniel Boone, John Jacob Astor, Bolivar, John Jay, Henry Clay, Horace Greeley, and Kit Carson to name but a few. Of special intrigue is finding reports of famous names before they became famous, such as inconspicuous mentions of Abraham Lincoln from 1848 when he was a member of Congress, or Jefferson Davis from 1833, nearly 30 years before becoming President of the Confederacy. Judaica interest, reports of pirates, the Black Hawk Indian War, runaway slaves, William Henry Harrison’s one month Presidency, and the earliest reports of the Mormons and the journey across the country provide fascinating reading in newspapers of the pre-Civil War era. The Monroe Doctrine is just one of an endless list of historical documents and landmark Supreme Court decisions which were reported in newspapers of the day. 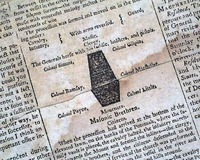 Early newspapers from Hawaii, Florida, and Kentucky among others, more commonly found after the 1870’s are a special treat when found before the Civil War. And more than American history found their way into American newspapers. The Battle of Waterloo and the other Napoleonic Wars with mention of Buonaparte, Wellington and other key European figures put world history into perspective when such reports are found alongside notable events in American history. If capturing history in the pages of the nation’s newspapers is your hobby, certainly there is much from the 1800 – 1860 period to excite any historical hobbyist. Do not overlook this fascinating era in the growth & development of the United States of America.